Boston’s history is full of odd and dramatic happenings. You all learned about the Tea Party and the Boston Massacre in elementary school, but did you ever learn about the Great Molasses Flood? No, I’m not making this up. 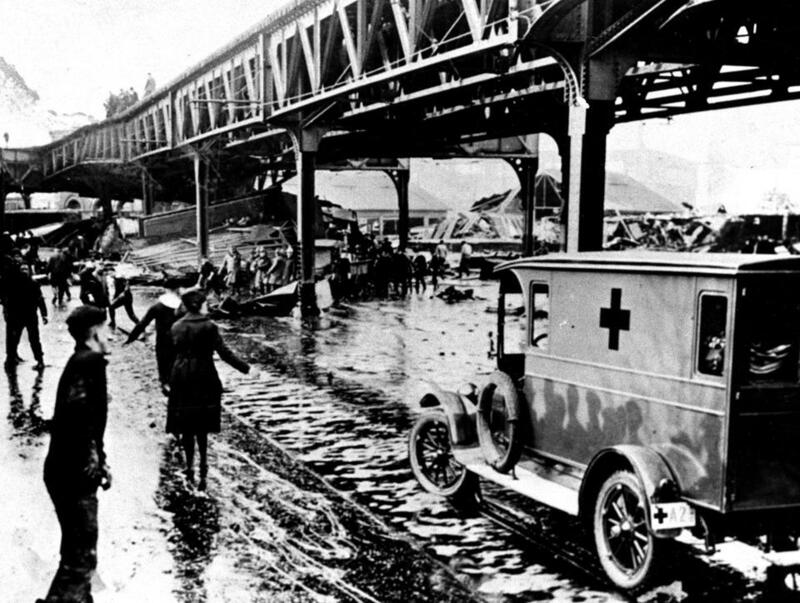 The Molasses Flood of 1919 is a real, well-documented event. It seems funny on the surface, but it was one of those horrifying, traumatic events with which Bostonians are, unfortunately, well acquainted. It all began with a huge tank for storing molasses, sort of like the big water tanks and grain silos with which we are more familiar. Owned by the United States Industrial Alcohol Company, the tank on Commercial Street was 58 feet high and more than 90 feet in diameter, holding 2,300,000 gallons of molasses. I’m not crazy about molasses, and it would take me quite a while to use up a gallon. But two million gallons? The distillery planned to use it in manufacturing rum. 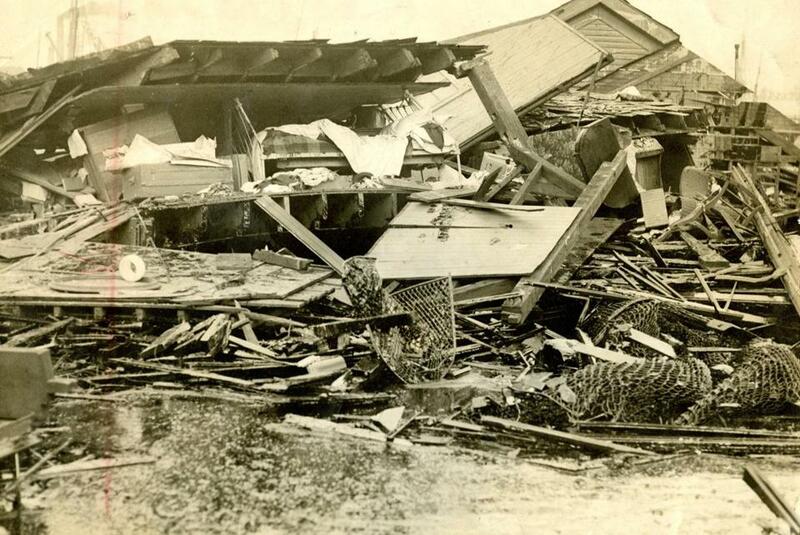 Taken January 16, 1919, the day after the disaster. The molasses tank was located at about the center of the photo. The unseasonably warm weather on January 15 changed the plans of everyone in Boston. The owners later claimed the explosion was caused by sabotage, but that story didn’t hold up. The court later ruled that the tank was overfilled and not adequately reinforced—some people said it was poorly constructed in the first place and had been leaking molasses for some time. What is known for sure is that the temperature had hovered near zero, but on that day, it rose into the mid-forties. Some people think the warm air caused the molasses to start fermenting and expand. Whatever the cause, about 12:40 in the afternoon, the giant tank exploded, sending pieces of the metal flying in all directions and releasing a surge of molasses that formed a wave, reported from eight to fifteen feet high. The wall of molasses rushed down the streets at 35 miles an hour. People couldn’t outrun it. Huge pieces of the tank hit buildings. One large piece landed in a park 200 feet away. Another hit a railroad piling, taking out a piece of an elevated train line. Some of the rubble from the tank. The molasses was to be shipped to a distillery in Cambridge. Many buildings were damaged, some ripped off their foundations. Several people were buried in the rubble of collapsed structures. Twenty-one people were killed, including at least two children, and more than 150 were injured, either by the shrapnel or the molasses itself. People were swept along in the flood. Horses were caught in it; automobiles were overturned and submerged; trains were lifted off their tracks. People hurried to the area to try to help. Cadets came from the USS Nantucket, a training ship docked nearby. Policemen, firemen, Red cross workers, army and navy personnel, and other volunteers came and found molasses still two to three feet deep in some places. If they tried to walk in it, they got stuck, or it sucked their boots off. Taken January 15 as rescue workers arrived. They found it hard to get near the scene. Hindered by the sticky stuff, they were able to pull some people out of the mess, but not everyone could be reached. Horses that were caught in the molasses and couldn’t be led out had to be shot. Days later, welders cut up what was left of the tank, still searching for bodies. The initial clean-up lasted several days with thousands of people at work, but the city wasn’t molasses-free for a long time. The city had its fire boat spray streams of water on the debris. Salt water was sprayed on the streets and houses to get the molasses off. Cellars for blocks around were filled with molasses and had to be pumped, which took months. The harbor was said to look black with molasses well into the summer. When people walked in the area, their shoes stuck to the cobblestones. And the smell lingered. They say for years you could smell it on a hot day. 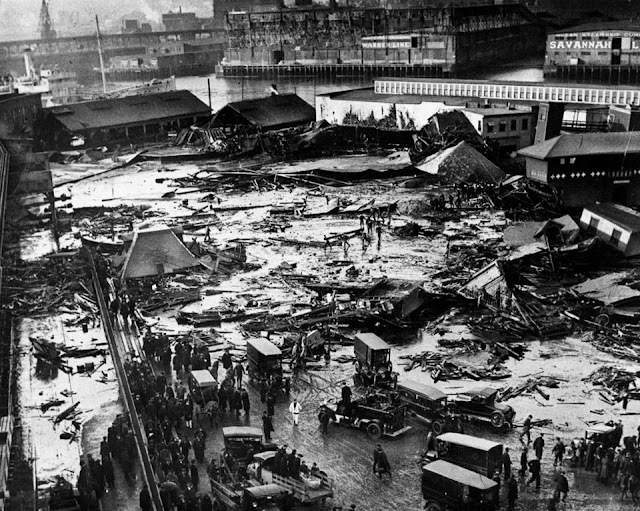 In memory of the Great Molasses Flood, today I’m doing a surprise giveaway of my novel The Crimson Cipher, in which you’ll learn about some other strange but true events that took place a few years earlier, in 1915 (paper or e-book). Comment below to enter. Oh, my, I just couldn't imagine what a sticky mess that was and what a terrible tragedy. It was one of the odder man-made disasters, for sure. Oh, Karla, I know! Imagine your cellar was full of molasses, and no one could come pump it for two or three months! That IS a strange, but terrible catastrophe. What a horrible mess to clean up! What an awful way to die! I agree, Bethany. The Crimson Cipher is about things that happened in the US prior to World War I--not things like this, but things like industrial sabotage and catching spies and other intriguing events we rarely hear about nowadays. Thanks, Tammy! When I started researching for The Crimson Cipher and reading nonfiction books written in the 1914-1919 period, I was amazed at how little I knew about the period, and how quickly we forget! Oh my word, I cannot even imagine that and I am trying to! I can see how it would take years to clean up - that stuff is beyond sticky and hard when cooled. What an odd disaster. Thanks for sharing! Yup. This is one of those "How could I not know this?" events! Wow! That was a fascinating story, Susan. Who would have ever thought! Thanks for sharing with us. Thanks, Debbie. They have a sign at the site, commemorating this event. A friend who had lived nearby mentioned it to me in passing, and I said, "WHAT? Whatever are you talking about?" That's what started me looking into it--it seemed so unbelievable. That is a very interesting piece of history I did not know. I am looking forward to your book to learn some more. Thank you for the chance to win. Thanks, Angela. The more I dig into history, the more interesting things I find! What an interesting bit of history, I can't imagine the resulting mess! Besides the initial horror of it, I'm sure that's what everyone remembered. I've never heard of this before. What a horrible, nasty mess. I hate getting syrup on my hands when I eat pancakes. I can't begin to imagine so much molasses and how much work it was to clean up. One of the side benefits of industry. I think there were many more industrial accidents than we know, but most were on a smaller scale than this. This is the first time I've ever heard about this, too. Sounds awful in so many ways! I just keep thinking, "At least they had plenty of water close by." I love learning about unusual tidbits of history. It is hard to imagine just how much molasses that would be and I am sure it thickened over time. I as sure that story was passed down with "I can remember when..." or "My parents told me...". I love your stories and hope to win this one. As others have said, first time I've ever heard of this, but WOW! So much molasses stored in one location, and then for the tank to explode. Mind-boggling! Thanks, Pam. Seems like one of those preventable things ... and yet, at the time, probably no one conceived of such a thing happening. Makes me appreciate our accumulated knowledge--we CAN learn from history! I'll have to impress my native Bostonian sister-in-law by chatting about this. LOL Truth is, I've never heard of it! But now I have. :) Fascinating and horrifying all at once. Poor horses! Yes, the idea of people and horses drowning in molasses was a bit much for me too. This event does seem like something we should have heard more about. Amazing! That was really interesting, Susan. Thanks for sharing. I can't even imagine the sticky mess it was! And of course, it's sad about the many people injured or killed. It surely caused much hardship for many. I love history and took history classes in high school and college, but this is the first time I've heard about this tragedy. Wow, this is an amazing posting. Read your books and they are great! Please enter me in your contest! Kay and Eliza, thanks for coming by! Yes, this was one of those things that you hope never happens again! I am suprised too to learn that it would explode...reminded me of the West Texas explosion. It seems like there is something always exploding and making a mess or damaging so much. near our area the sugar refinery had explosion and much burn victims. I guess it's a hazard of the industry, Paula. It certainly was a horrible thing! Wow, Susan. That's an amazing story! How awful to try to clean the mess up. And how horrific to be caught in it. I learned another new fact of history today. Thanks. So interesting! Thanks for the post adn the giveaway! Thank you, Marilyn and Ladette. I see that I didn't put a limit on the time for the giveaway, so I'll leave it open through Saturday night, and on Sunday I'll draw the winner. As they say, sometimes the truth is stranger than fiction! Very interesting...thanks so much Susan! And thanks for the giveaway!I really love your books! Boston has had it's share of odd disasters. I had read about the molasses flood in another Christian fiction book several years ago. It is such an odd disaster, if it hadn't had such serious consequences it would be extremely funny. I love your books and would love to read this one. Thanks for the wonderful giveaway. Wow, amazing. I know I am late on here, but just wanted to let you know that I enjoyed the post! That is such an oddball but interesting fact of history! That's the kind of story that is just so ridiculous and so outrageous that you'd find it in a child's story book. How is that not as well known as the tea party? If I had read about that in history in grade school I would've loved to read more about it or done a book report on it! Thanks for your post and this awesome history lesson! Good morning, night owls! I do think a lot of the most interesting things are not in our school books. I love that we have a place like this to talk about them. Wow... I've read a lot of books, but I've never read about that event! I have never heard that story. I grew up in the port city of Wilmington, NC only 4 blocks from the river front. Not too far away were large storage tanks of gasoline and also of molasses. Of course, even as a little girl, I knew that it would be terrible if the gas tanks exploded or started to leak. But then I wondered, in little girl fashion, what would happen if the molasses tanks leaked. Molasses can taste mighty fine on a hot, buttered, fluffy Southern biscuit. But too much of a good thing is too much and I just wondered about that HUGE tank and what a mess it would make. Of course, I didn't consider a danger to everyone and everything in its path should it actually explode. Food (or sticky) for thought. P.S. My husband who also grew up in Wilmington, said the tanks in Wilmington had leaked. He didn't know how much, but had heard stories of their leaking. Very interesting, Vera. And another coincidence--I used to live in Wilmington, NC for a short time. I read in my research that the tank that exploded in Boston had been leaking and people had been collecting the drips for their own use. Thanks to everyone who took part. The winner of The Crimson Cipher is Ladette Kerr. I will email you privately, Ladette.